Microsoft has been working on the newest update for its Windows Phone Platform called ‘Mango’, which is due this year. The company had revealed some of the new features including multitasking, Internet Explorer 9 mobile and Twitter integration, which will be a part of the update. 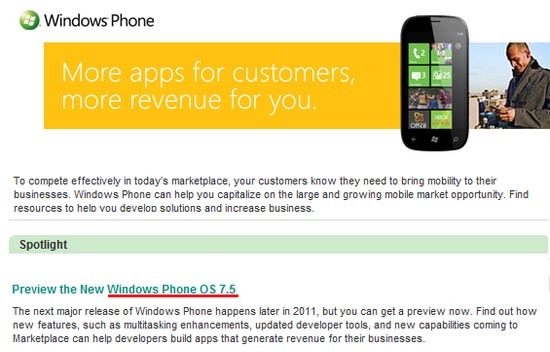 The company had earlier slipped that the new update aka Mango, will be called Windows Phone 7.5 at its MIX11 event and also it has been seen on a few posts by the company. However the Microsoft staff and Achim Berg, Corporate Vice President of Windows Phone Marketing don’t confirm the branding. The picture below, however, clearly shows the confirmation that the new update, will be 7.5.